Barcelona escape Copa expulsion after federation rejects Levante complaint – Royal Times of Nigeria. Barcelona will remain in the Copa del Rey after the RFEF’s competition committee said on Friday it had rejected Levante’s complaint that the Catalan side fielded an ineligible player. A report in El Mundo on Thursday claimed Barca faced expulsion from the competition after picking Juan “Chumi” Brandariz Movilla in their first-leg round-of-16 match against Levante last Thursday when he should have been banned. Levante club president Quico Catalan filed a formal complaint to the RFEF on Thursday night. 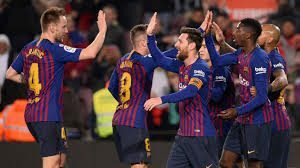 However, the federation’s competitions committee stated on Friday that Levante had missed the filing deadline and Barca, who won the last-16 tie 4-2 on aggregate, would be allowed to participate in the Copa draw where they were eventually paired with Sevilla on Friday. Levante said they will appeal to the Court of Arbitration for Sport. The federation’s decision means Barca escape the fate of Real Madrid, who were thrown out of the 2015-2016 Copa del Rey for playing Denis Cheryshev in a last-32 game against Cadiz when he was supposed to be serving a suspension from the previous season when he played for Villarreal.